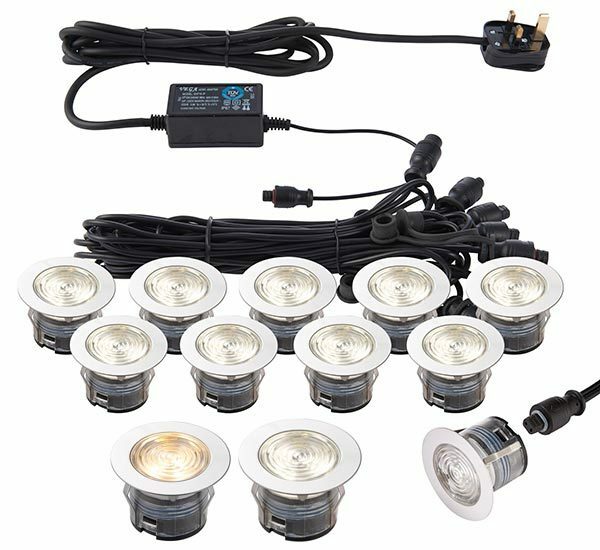 The IkonPro stainless steel 10 light 45mm CCT 3000k or 4000k LED deck light kit is rated IP67 and features a unique design of ten removable and interchangeable heads. The new Fresnel lenses improve lumen output, diffusing the spread of light evenly. Within each head there is the choice of 3000k (warm white) or 4000k (cool white). This kit contains: 1 x IP67 rated driver with 3 metres of mains cable and mains plug. 1 x 5m extension cable. 2 x 5 LED head looms (total length 7.5m per loom). 12 x end plugs. Power Supply: 220-240V 50Hz. Output: 12V DC 15W Max. Constant voltage.